There have already been nine shootings that resulted in injury or death at US schools in 2018, and the year has just begun. The shooting at a high school in Parkland, Florida, left 14 students and 3 teachers dead, and injured more than a dozen others. It was the worst school shooting since the 2012 tragic killing at Sandy Hook Elementary School claimed the lives of 20 children and 6 adults. There have been many calls for more strict laws on gun sales and ownership in the aftermath of these tragedies. But gun rights campaigners regularly succeed in stifling those calls. In fact, the political will aims at the moment to increase, rather than decrease, the number of firearms in schools, suggesting that arming teachers and school staff could be the solution. It is easy to see why this is a recipe for disaster, as well as an indicator that America’s gun violence epidemic is far from ending. For Scotland, one school shooting massacre was enough. In March 1996, 16 young children (all aged 5 and 6) and their teacher were murdered in a Primary School in Dunblane, Stirlingshire. The 43-year-old perpetrator was the legal owner of the rapid-fire handguns used to inflict gunshot wounds in a total of 32 people. It all happened over a 3-4-minute period, after which he killed himself. Shock and grief soon turned to a great public debate on gun legislation and petitions calling for a total ban on the private ownership of handguns in the United Kingdom. The media played a vital part in the campaign, not only informing the public but also articulating the views of the majority of the country. The Snowdrop Campaign, founded by friends of the bereaved families, was signed by 750,000 people within ten weeks. By the time it was presented to parliament, the number of signatures was above one million. In response to all the public commotion and the extensive campaign that followed the Dunblane tragedy, the Conservative government introduced the Firearms (Amendment) Act 1997, which banned cartridge ammunition handguns with the exception of .22 cartridge handguns. In the same year, when Labour was elected, the Firearms (Amendment) (No. 2) Act 1997 was introduced, implementing a complete ban. All handguns (including the .22 cartridge ones) were to be surrendered by the end of February 1998. But the campaigners were still concerned that a permanent gun control organisation was needed not only to oppose any moves to reverse the new legislation but also to campaign for the tightening of loopholes in existing laws. 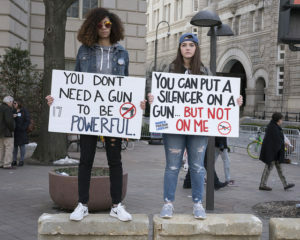 A group made up of academics, lawyers and parents of victims formed the Gun Control Network, which is still active today, promoting research and informing the public. Naturally, the Gun Lobby resisted these restrictions and their favourite argument still persists: “It’s not guns that kill people, it’s people that kill people.” But why, then, should we allow people (who can possibly kill other people) to own guns that are capable of killing so many in a few minutes? A major – and important – distinction between different perspectives of firearm regulation around the world is whether civilian gun ownership is considered a right or a privilege. If it is a right, it can only be taken away from a gun owner after it is proven that he poses a threat to people- and it might be too late by then. But if it is a privilege, the owner needs to justify the need of a weapon and will be subjected to social and psychological evaluations. Britain’s current laws are considered among the most restrictive in the world. Not surprisingly, fatal shootings are rare, and the record of deaths from firearms is very low – at below one per million people annually. Scotland has its own legal system and has strengthened the law further, requiring a licence for all air weapons. As a result, it has an even lower record of deaths from firearms. In fact, guns are a rare sight in this country. Only 2 percent of police officers carry guns. And, as a result of the stricter laws and the ban, it is now virtually impossible for someone to legally buy a gun that could be concealed in his pocket and carried unnoticed into a school. Scotland took the actions to avoid something like Dunblane from ever happening again. And, 22 years later, it hasn’t. There is certainly a lesson in all of this that the United States could contemplate.